If you’re like me, you had to see Rogue One a couple of times to understand just what it was about the film that didn’t grab you. Now, don’t get me wrong, I think it’s a fine film, but it’s not a great film. It does feature some of the best war footage the franchise has ever seen, but when it comes down to it I had a hard time connecting with it. And after a second viewing I think I finally understand why. One of the problems facing the now Disney owned Star Wars Franchise is the same problem facing the, also Disney owned, Marvel cinematic universe. With a new film hitting theaters every year, they're bound to start bleeding together in our memory. That's particularly problematic when the series tends to follow the same general outline for every film. Was Rogue One the one with the lovable robot sidekick? The one where the heroes have to infiltrate an enemy base using stolen codes, hiding in floorboards, and eventually disguising themselves in empire outfits? Is it the one with the parallel lines of action in which one group fought on a planet surface while a space battle raged nearby? And didn't someone have to shutdown a shield generator somewhere in there? Yes to all of the above, and yet that doesn’t quite narrow it down. 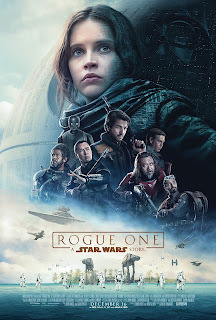 Rogue One, despite having bits of humor, exciting action and exceptional special effects, didn't always have a good handle on its many side characters, most of whom don't get their backstory or motivations fleshed out. Despite the ensemble of interesting characters and diverse cast to play them, Rogue One is only ever interested in it's central female. And that wouldn’t have been too problematic had it not seemed clear just how much of her story was cut out. We see Jyn (Felicity Jones) as a child bearing witness to her mother’s death and her father’s abduction. But the film skips forward over a chapter in her life in which she was raised by rebel leader Saw Gerrera (Forest Whitaker). It’s briefly talked over, and is clearly supposed to carry some sort of emotional weight the film doesn’t earn when the empire eventually attacks. It’s hard to feel anything for Gerrera considering we’ve only seen him for a few minutes. Clearly he played a bigger role in scenes that ended up on the cutting room floor - as evidenced by the shots of him in trailers with far shorter hair than he has in the final film (among many other trailer shots not present in the final film). It’s a movie based on a relatively minor flaw in the series that no one really needed explaining in the first place. Yes it was strange that there was a design flaw that allowed one shot to destroy an entire, enormous space station, but I’m not sure that justifies an entire movie. In fact, it plays a bit like A New Hope if that film had ended without resolving by ending the threat. Rogue One establishes the terror of this overpowered, oversized space station, but ends by passing the problem on to another film with more likable, more relatable heroes. And I won’t even get into the ways the film doesn’t quite line up properly with where A New Hope begins, or the troubling moral dilemma of casting a dead actor to reprise their role via CGI (Tarkin, not Leia, though the CGI Leia didn’t look quite right either). Having said all of that, there’s still no reason Rogue One couldn’t have been a good movie if only it had created compelling characters we could care about. If there was an ounce more Ocean's Eleven to this heist movie it may have made for one of the strongest Star Wars films yet (what if each character was there due to their specific skill set?). Instead there are a lot of flat characters that director Gareth Edwards fails to make a connection with. It never quite sold me on these random heroes and the sacrifice of their own individual motivations in favor of following Jyn. And while that’s partly the fault of the writers, I place the majority of the blame on Edwards, who frequently seemed to not understand how to deal with so many characters. For instance, there is a scene aboard their ship in which the group has perhaps unintentionally gathered. They’ve just fled the scene of the destruction of an entire city. Chirrut and Baze are likely distressed over the fact, but the scene also has to contend with the fact that Cassian has just received orders to kill Jyn’s father. There is clearly an internal battle in Cassian’s mind over whether or not to trust Jyn or follow orders. Yet the scene very flatly plays mostly from her perspective as she pleads her case and everyone else remains mostly silent. The scene even ends on an extended shot of her face rather than Cassians. Think of how differently the scene could have played had it been done from his perspective, seeing his internal struggle, and perhaps getting a bit of insight from two grieving warriors ready to join the rebel cause. And for a film whose main strength is its battle footage, it rarely utilizes those sequences for character moments the way previous Star Wars films have. As Mr. Plinkett mentioned in his review, Rogue One frequently lacks those all important human moments that create an emotional connection. He compares a shootout between our heroes and a group of stormtroopers in Rogue One with a similar scene in A New Hope. There is no banter, no quips, no dialogue whatsoever to help establish personality or perspectives in Rogue One. He even goes as far as to re-edit the scene from A New Hope cutting out the dialogue from the heroes in order to make it play more like the one found in Rogue One, and what a lesser scene it is because of it! Instead it’s people we don’t know very well having shootouts with faceless stormtroopers. As a result Rogue One doesn’t create the emotional bond to likable characters found in the original trilogy. And the few bits of banter it does have frequently come from the film’s most likable character K-2SO, but even a lot of his lines comes off as fan servicey nods to C-3PO’s frequent, unwanted stating of the odds. I don’t want it to sound like I hated Rogue One. I didn’t. But it’s far from the movie I was hoping it would be. I think it does a great job looking the part with its production design, costume design, and special effects. It evokes the grungy, lived in universe of Lucas’s original trilogy even better than The Force Awakens. And the Vader scene toward the end is every bit as brutal and force power-happy as every Star Wars fan has ever wanted. And the musical swell toward the end of his rampage got me every time. But when it isn’t channeling the films of Star Wars past, it’s underserving its new characters before discarding them from the franchise for good. The result is a fine collection of action sequences I felt little connection to.